Description: Every year from 1987 to 1995 (and maybe even after that) Fisher-Price made a round clear glass Christmas ornament with etched glass art work of Fisher-Price toys or related items. All of the ornaments that we are aware of are listed below in order by year. 1987 - FPT19788 - Round clear glass Christmas ornament with etched glass art work of a Puffalump mouse (#8016 Chritmas Mouse). The ornament is marked "1987" under the mouse. 1989 - FPT3993 - Round clear glass Christmas ornament with etched glass art work of a Fisher-Price teddy bear (#1322 Teething Ring Teddy). 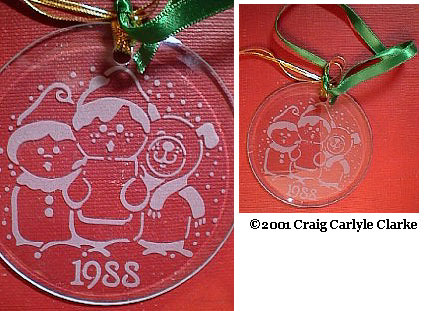 The top of the ornament is marked "Fisher-Price" and the bottom is marked "1989". 1992 - FPT3996 - Round clear glass Christmas ornament with etched glass art work of a Chunky Little People figure dressed up as Santa Claus with "snow" in the background. The top of the ornament is marked "Fisher-Price". The bottom is marked "1992". 1993 - FPT3997 - Round clear glass Christmas ornament with etched glass art work of a Puffalump reindeer figure (#8142 Puffalump "Rudolph the Red-Nosed Reindeer") with "snow" in the background. The top of the ornament is marked "Fisher-Price". The reindeer's scarf is marked "1993". 1995 - FPT3999 - Round clear glass Christmas ornament with etched glass art work of a snowflake that is made of 6 large toy soldiers and 6 small toy soldiers. The top of the ornament is marked "TOY TOWN MUSEUM EAST AURORA NY. The bottom of the ornament is marked "GRANT OPENING DECEMBER 1, 1995".